When art & culture is used to elevate the consciousness of the people, they’re transformed into tools of resistance and liberation. This is the gallery of creative resistance artwork submitted to the Basta Texas campaign. Basta Texas is calling on all artists, painters, poets, musicians, visual artists, performers and filmmakers to use their talents to help the migrant communities and their supporters in Texas. Help us turn uncertainty, fear and anger into courage to fight, courage to peacefully resist, and courage to love even our adversaries. 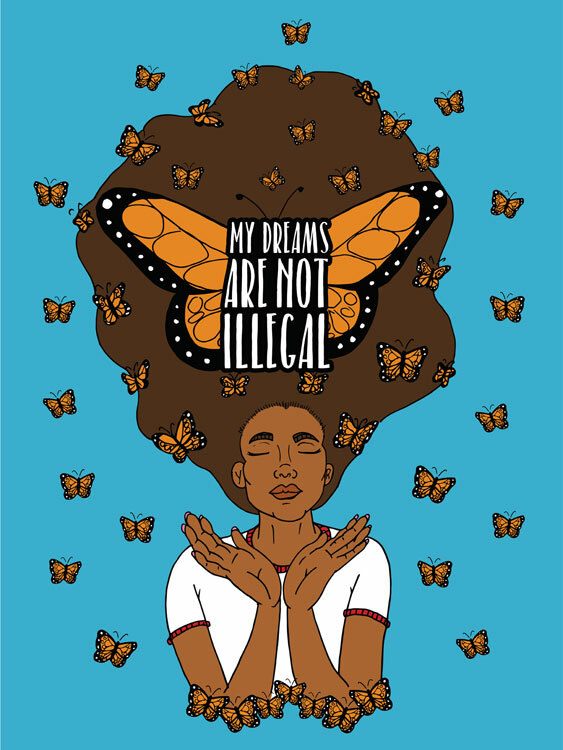 The Basta Texas campaign held a poster creation campaign that called for submitting posters on issues affecting immigrants, from fighting back against SB4 to defending DACA and TPS. A panel of artists selected a winner from all entries below. A huge thank you to all artists who submitted their work. Congratulations to Jocelyn Riojas, winner of the Basta Texas Resistance Art contest! Her piece My Dreams Are Not Illegal (displayed at left) was selected by a panel of Texan artist and academics to win a cash prize of $1,000 and will be printed to be shared with immigrant and Latino rights organizations! ¡Arriba el arte! ¡Basta al odio!